This recipe has quite a few things that wouldn't be found in your average kitchen cabinet, and will initially require a trip to the grocery store or health food store to stock up on them. That, in combination with the requirement of ripe bananas, means you must plan ahead! The moral of this story is that healthy breakfasts almost always will require some planning on your day off. 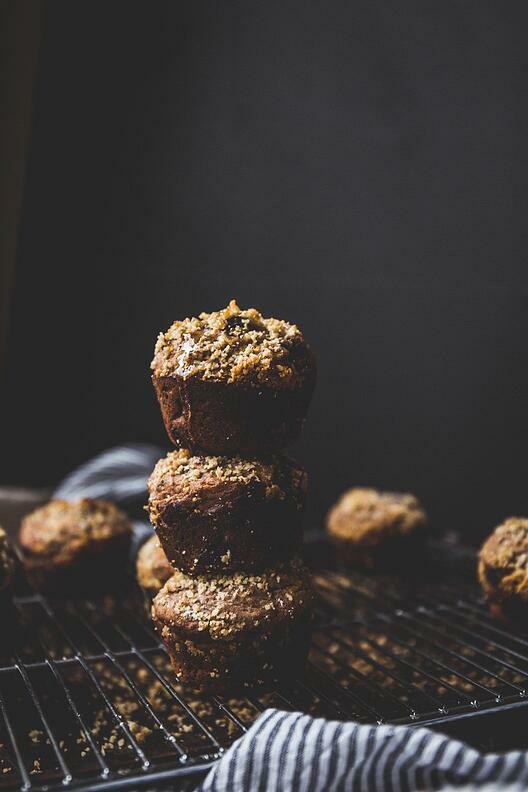 So, print this recipe out on a http://thebakerwhokerns.com/date-walnut-blueberry-breakfast-muffins-df-gf/ Wednesday, go to the store and purchase what you may not already have, and make this batch on Sunday when your bananas have ripened. ** This adds another delicious dimension of flavor to the muffin, if your local store stocks it. alternatively, if you search a chai spice mixture (like this one) you can make it yourself very easily. Preheat oven to 375 degrees. Grease a muffin pan with butter or non-stick spray and set aside. Prepare the flour mixture: Add walnuts to a food processor and blend into a coarse flour. Add to a mixing bowl along with brown rice flour, tapioca flour, baking powder, cinnamon and salt. Whisk together until combined. If you opted for chai spice, add it in now, too. Prepare the wet ingredients: Add the pitted dates and bananas to a food processor and blend until fully incorporated. Transfer mixture to a different large mixing bowl along with the almond milk, melted coconut oil and vanilla extract and mix together with a hand mixer on low speed until well combined. Add the eggs one at a time making sure they have each been mixed in before adding the other. Add the flour mixture to the wet ingredients in small batches and beat on low speed until there is no more flour visible. Do not mix too much, you don’t want to overwork the batter. Fold in the cup of blueberries. Divide batter among prepared muffin pan. Bake muffins for 18 to 20 minutes until golden and crisp and a toothpick inserted into the center of a muffin comes out clean. Let muffins cool for 15 minutes before removing. Drizzle honey on top for some extra sweetness and serve. Store extras in an airtight container for a nutrient dense, on-the-go breakfast all week!